This exhibition takes its title from the film L’homme qui voulait savoir (literally “The Man Who Wanted to Know”, English release title “The Vanishing”), directed by Paris-born Dutch director George Sluizer in 1988. In the film, the young couple Rex and Saskia have stopped at a freeway service area when Saskia inexplicably vanishes; Rex spends the next three years trying to find her, in what is not so much as thriller as a meditation on the destructiveness of an obsessive need to know. When Rex ultimately solves the mystery he too disappears, leaving the viewer, who has identified with him all along, deprived of the closure that the end of this kind of film traditionally brings. 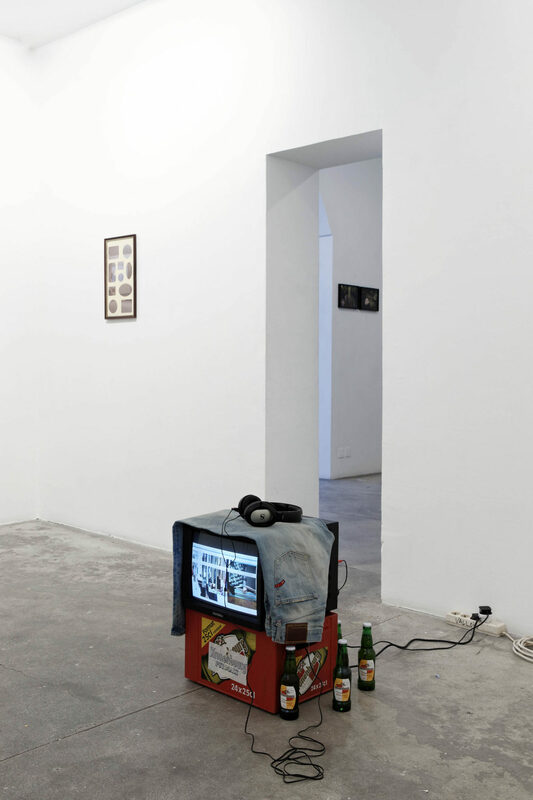 For his first exhibition in France British artist David Raymond Conroy uses the dynamics of cinema to construct a space in which the three accomplices in the aesthetic experience – artist, work, viewer – seek each other out through speculation about their relative positions. 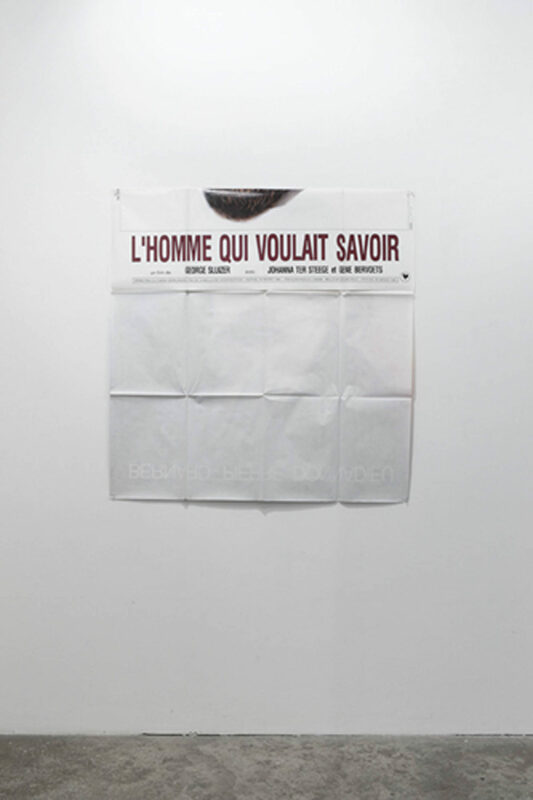 The poster for the French version of L’homme qui voulait savoir is included in the exhibition, as if its presence as object were needed to justify the borrowing of the title – even if it provides no extra information. 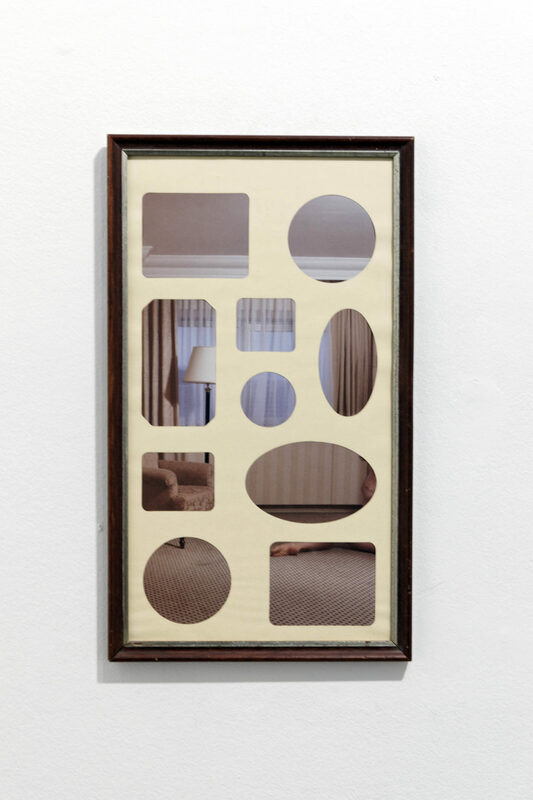 The artist himself vanishes behind this mirror-effect. Jonathan Richman, iconic former leader of the Modern Lovers, is seen in excerpts from various video interviews, expressing himself in such a spontaneous, naively direct way that we find ourselves wondering if he isn’t playing a part. Also speaking in the first person, David Raymond Conroy similarly explores the possibilities of sincere personal discourse in the video Hauling/It is not the past, but the future, that determines the present. The artist seems to waver between the vanishing of the artistic act and expression of a subjective point of view. Two installations continue this inquiry into oscillation. 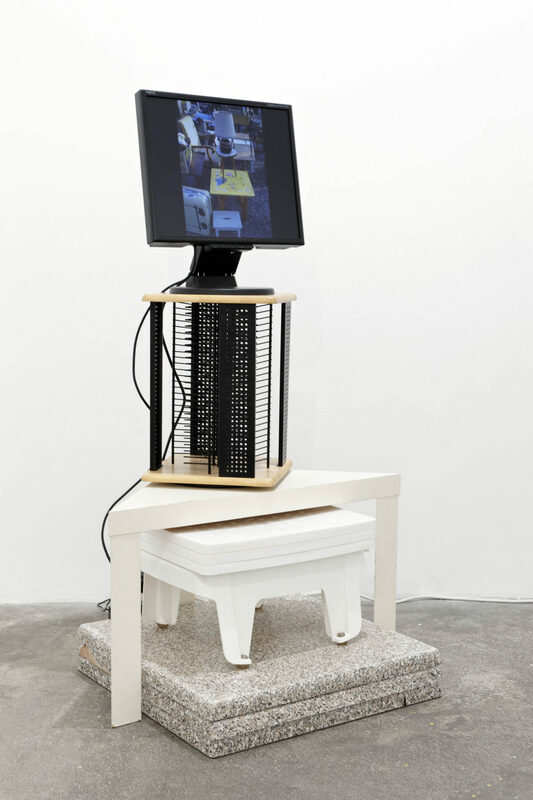 The first is a carefully constructed pile of pieces of furniture, topped by a screen showing video images of similar stacks found in the street or at markets. While the video is running the stack functions as a base and our attention is fixed on the images scrolling by. When the video switches off the gallery context becomes more tangible and the assemblage turns into a sculpture. 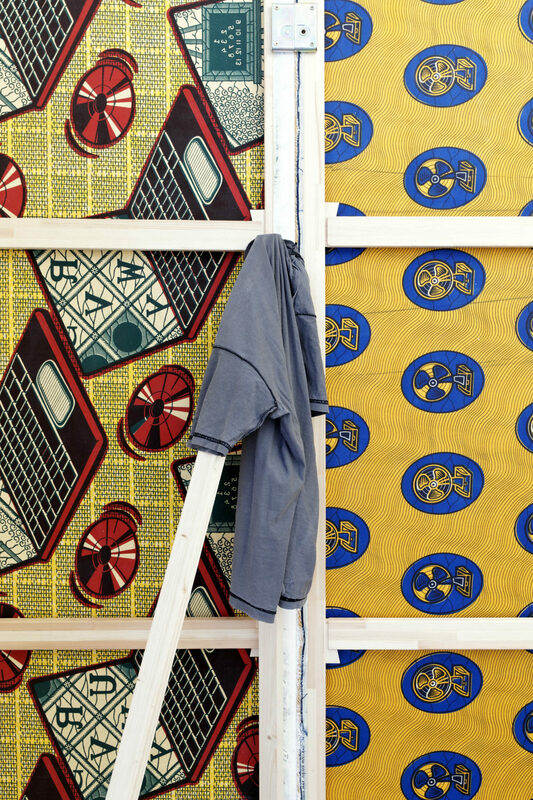 The second installation comprises three movable stage partitions which block direct access to the gallery’s other room; some visitors will not realise that this is a work of art until they succeed in entering the second space and discover that the backs of the partitions are completely covered with Dutch wax fabric. What we have here may be an artwork pretending to be a wall or an artwork pretending not to be an artwork. 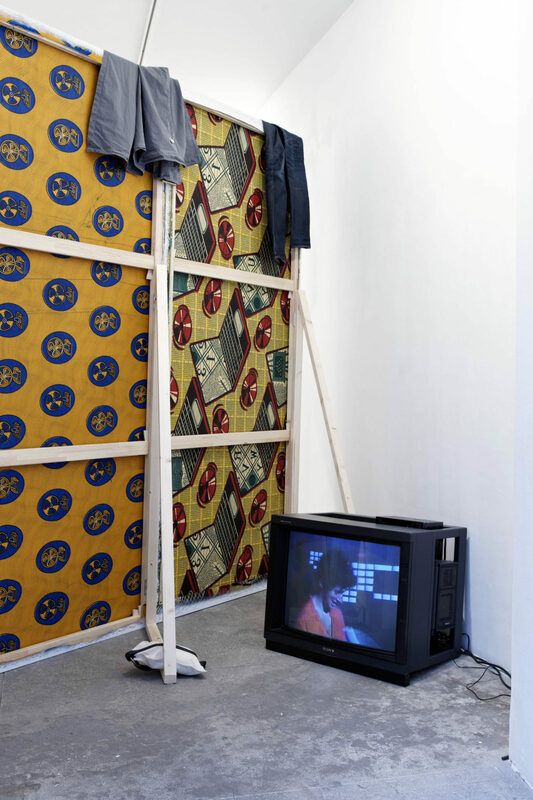 Quoting Jeff Wall from memory, Conroy remarks that “the work is not a sea of meaning from which the viewer can fish at random.” Here he scatters the space with elements which, like clues in a police investigation, enable us to explain the provenance or the shaping of certain processes: the poster provides the title, a video documents the sources of inspiration of the sculpture it is presented on, and the wrong side turns out to be the right side. These factors, enhanced by our detachment in interpreting them, highlight the gap between “knowing” and “understanding”. * « the work is not a sea of meaning from which the viewer can fish at random », l’artiste cite de mémoire.